Regular readers of this site and Make Magazine know I’m a big fan of Limor Fried’s MIDIsense, a physical computing (aka real world aka sensor input) MIDI board. Sensor data goes in, MIDI goes out, and thanks to standard MIDI DIN connectors, you can plug it into any computer MIDI interface or music hardware and use the data as-is. Want to build a flex sensor glove and plug it into your KAOSS Pad, sans computer? No problem. The software is essential even if you intend to use the board with hardware rather than software, because it lets you configure ranges and MIDI assignments for each sensor. I suspect the source code may be useful to you power users out there programming your own custom MIDI projects. Limor says the C++ code is on its way to Mac soon; in the meantime, the existing version works — the C++ version will only work better, when available. Incidentally, since a reader recently asked, the one thing this board won’t do is send outputs, like driving LEDs or motors. For that, you’ll need something like Eric Singer’s MidiTron board, which is more expensive ($150 instead of $50) but will better suit some projects. If you’re in the NY area, you can learn more about the MidiTron at Lemurplex in Brooklyn. 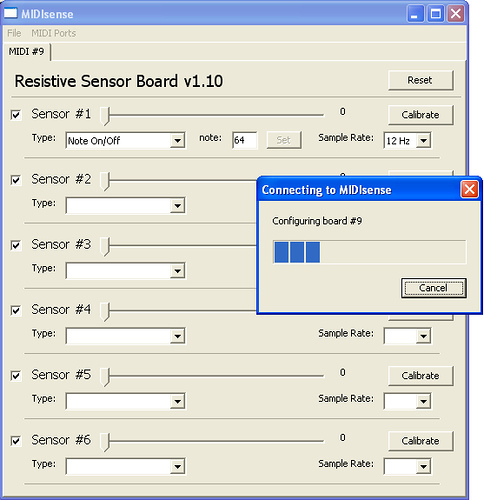 I do like the MIDIsense, though, as a quick, simple sensor-reading board. See previous CDM coverage and the article I wrote in MAKE 07 for more, and watch for an upcoming project in a future MAKE (more on that soon). And for the patient, see Limor’s flickr screen for a glimpse of what’s in store for MIDIsense: more inputs, and for the first time, outputs. That’s great news, because while I like Eric’s board, it’d be even better to have an open source alternative so you can make modifications.